When the weather is still firmly clinging onto winter, there’s nothing like a hearty soup made with fresh, seasonal ingredients to keep you warm. 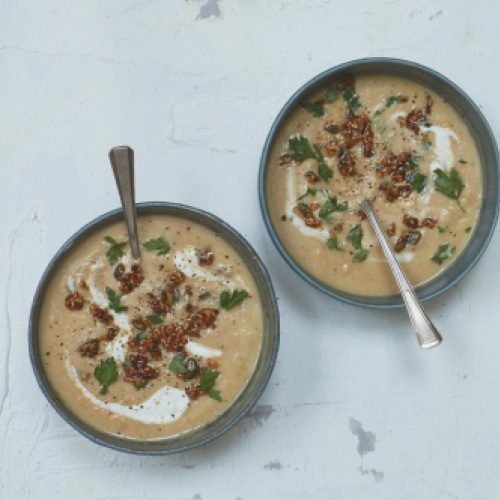 This recipe is made with coconut yoghurt, so is perfect if you’re looking for a vegan option – just swap the honey for maple syrup or agave syrup when preparing the seeds. 1. Heat the oven to 200°C/400°F/gas mark 6. In a large roasting tray, add the artichoke, parsnip and apple. Drizzle with oil and season. Roast for 45-50 minutes, until tender and caramelised. 2. In a frying pan, heat a tablespoon of oil and add the seeds. Cook over a medium heat until starting to pop. Stir in the honey and soy, and fry for a minute until dark and sticky. Pour on to greaseproof paper and cool. 3. When the veg is nearly done, heat a glug of oil in a deep saucepan. Fry the onion for five to six minutes. Add the garlic and then the roast veg. Fry for five minutes, then add the stock, vinegar and mustard. Bring to a simmer, season and add most of the parsley. Simmer for five minutes, then turn off the heat. 4. Blitz with a stick blender and season. Add most of the yoghurt and lemon juice. Serve with crusty bread, a dollop of yoghurt and a garnish of parsley and seeds.